For anyone who is already certified in CPR and AED but looking to add to their knowledge base with a first aid course. Also great for new moms and dads! This course is for anyone with limited or no medical training who needs a course completion card in First Aid to meet job, regulatory or other requirements. Examples would include Police Officers, Teachers, Coaches, etc. 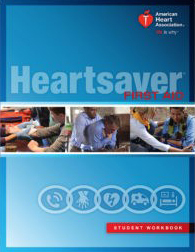 Heartsaver® First Aid Online Part 1 is a Web-based, self-directed program. This program teaches students critical skills and knowledge needed to respond to and manage an emergency in the first few minutes until emergency medical services (EMS) arrives. Content includes how to help a victim with bleeding, sprains, broken bones, shock and other first aid emergencies. Part 1 can be completed in 1 hour to 1.5 hours. Continuing Education Hours: The American Heart Association has been accredited as an Authorized Provider by the International Association for Continuing Education and Training (IACET). The American Heart Association is authorized by IACET to offer 0.30 Continuing Education Units (CEUs) for the initial online course. A renewal online course option is not available at this time. 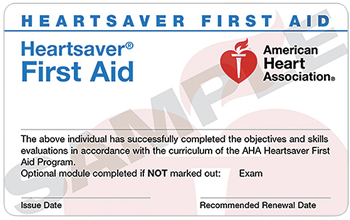 American Heart Association HeartSaver First Aid Course Completion Card is valid for two years.